Rat snakes are medium-size constrictors prevalent throughout the United States. 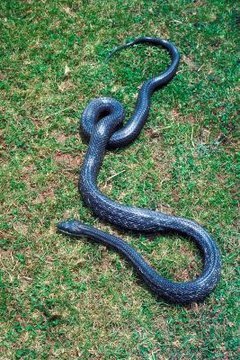 Members of the large Colubridae family, rat snake species spend their lives in woodlands, farmlands, rocky outcroppings, swamps and even abandoned buildings. Periods of growth and maturity mark each stage in a rat snake’s life cycle, and it all starts inside an egg. Each year in the late spring and early summer, rat snakes emerge from hibernation and seek out mates. Males tend to be a bit passive when it comes to courting; they wait for a female to pass through their territory and then emit pheromones to attract her. The mating process can last a few minutes or several hours, depending on the two snakes. Rat snakes are oviparous reptiles, and, depending on the species, can lay up to 40 eggs in a single clutch. The average incubation period is between 65 and 70 days. Rat snake hatchlings are typically between 10 and 16 inches at birth. These hatchlings are voracious eaters who quickly double in size. As juveniles, they eat small lizards, baby mice and small frogs. Juveniles of any rat snake species tend to have blotched coloring, which darkens and uniforms as they grow into adults. Rat snakes are considered adults once they reach sexual maturity, at roughly 4 years of age. Most of the common rat snake species, including the Eastern rat snake (Pantheropis obsoletus) and the black rat snake (Elaphe obsoleta obsoleta), grow between 4 and 8 feet long and around 2 inches wide; they are some of the longest snakes indigenous to North America. Rat snakes are among the shyer, nonassertive snake species, preferring to remain motionless in the face of danger. They also produce a fetid musk to deter predators. As carnivores, their diet consists of mice, rats, chipmunks, moles, young birds and bird eggs. This period of consumption and reproduction is by far the longest stage in a rat snake’s life cycle. Individual rat snakes' life expectancies vary according to environmental factors and according to species and subspecies. With that considered, a wild rat snake lives on average 10 to 15 years. With proper dietary care and housing, a captive rat snake can live more than 30 years.